Israel may be the world’s next energy superpower. 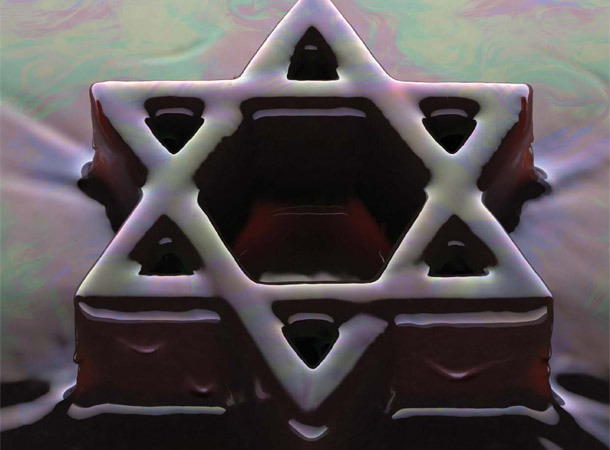 But is this good for the Jews? 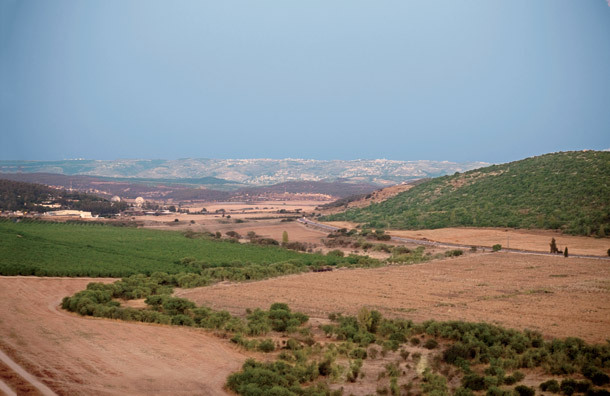 In Central Israel, not far from Jerusalem lies the Valley of Elah, a fertile region of oak forests and checkerboard fields bordered by limestone hills. In the Book of Samuel it is described as the place where David slew Goliath, thereby securing the future of the ancient Israelites. Seventy million years ago, the Mediterranean Sea washed over this area. When the water receded, it left behind sediment that eventually hardened into a thick layer of shale laced with hydrocarbon-rich kerogen. And that is why, if you ask the 41-year-old Israeli geologist Yuval Bartov, the Valley of Elah is now the place that could secure the future of the modern Israelites. On a recent June afternoon, Bartov drives me to an overlook here, and points off in the distance, beyond the field of red peppers, to a shed half-concealed behind greenhouses. “That’s where our pilot project will take place,” he tells me. Some time in the next few months–barring bureaucratic delays or roadblocks thrown up by Israel’s feisty environmental movement–Bartov plans to drill several wells into the bedrock here, going down 1,000 feet. His target: a potential mother lode of fossil fuels. 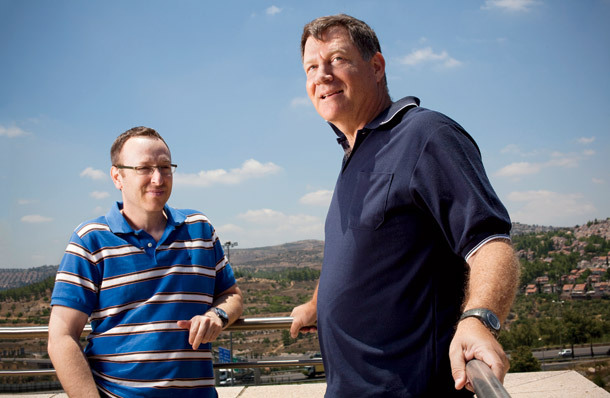 Bartov works for Israel Energy Initiatives (IEI), a Jerusalem-based startup with Goliath-size ambitions. In July 2008, the company obtained a license to explore 92 square miles of rural land in southern Israel. According to a 1980 study by the Geological Survey of Israel, the land may contain one of the world’s largest deposits of kerogen-rich oil shale. Had the same rock been buried thousands of feet deeper, where temperatures range between 158 and 338 degrees Fahrenheit, it would have converted over millions of years into liquid crude. But no matter: In the past century, scientists discovered that by heating such rock to extremely high temperatures, they can transform the kerogen into oil–in effect, speeding up geological time. How much crude could there be here? Bartov and I drive from the Valley of Elah to a wheat field at the edge of a road near the town of Kiryat Gat. This is the site of one of seven exploratory holes that IEI has drilled over the past two years. The rock samples were analyzed by IEI chemists at Ben Gurion University in Be’er Sheva and at Weatherford Labs in Houston. Bartov says their estimates matched the company’s “highest expectations”; if so, the equivalent of 500 million barrels of oil may lie beneath this wheat field. “What you see here would supply Israel’s needs for five years,” he says. And that’s just a tiny percentage of the territory controlled by IEI. According to Bartov and other IEI geologists, oil-shale deposits in Israel could produce as much as 250 billion barrels of crude. That’s roughly equal to the total reserves of Saudi Arabia. The potential changes go beyond economics. With both Europe and the U.S. seeking to reduce their dependency on Arab-world crude, an oil-and-gas-rich Israel could arguably reshape the balance of power in the region. “Look at how Russia established its power in Europe and the world,” says Gideon Tadmor, CEO of Delek Energy, an Israeli partner in the offshore gas fields. “Its clout is not due to weapons or military capability, but to its energy supplies.” Dore Gold, Israel’s former ambassador to the United Nations and president of the Jerusalem Center for Public Affairs, says Israeli clout as an energy exporter could reshape Israel’s relationship to Europe. Significant obstacles stand in the way of this potential revolution. In January, Israeli Prime Minister Benjamin Netanyahu drove legislation to end the country’s dependence on oil by developing alternatives. More significantly, extracting crude from oil shale is difficult and fraught with peril. For nearly three decades, Royal Dutch Shell has been trying to heat shale below ground in Colorado, with limited success. A coalition of Israeli environmental groups has filed a lawsuit calling the project potentially hazardous, even though IEI’s process is nothing like the oil-shale “fracking” that has riled U.S. environmentalists. Harold Vinegar, the alchemist behind IEI’s oil-shale project, holds up a glass vial to the late afternoon sunlight that pours through his office window in the hills of western Jerusalem. An ebullient man with a mad scientist’s shock of white hair, he’s showing me some fine-quality light crude that he distilled seven years ago, from Colorado oil shale. Like an oenophile, he swirls the translucent fluid. “See how clear it is?” says IEI’s chief scientist, a Harvard physics PhD who was once the chief scientist for physics at Royal Dutch Shell. Vinegar starts off by telling me about a group of scientists who were dispatched in the mid-1980s by Shell to Kvantorp, Sweden, to investigate a curious oil-shale project started during World War II. Desperate to find secure energy supplies during the conflict, Sweden had mined and baked oil shale at 600 to 800 degrees Centigrade for 20 to 30 minutes in ovens known as retorts. The resulting vapor was distilled and refined into transportation fuels.”They’d cook the stuff and make a really crappy oil,” says Vinegar. “It was a dirty operation.” But Swedish engineer Fredrik Ljungstrom refined the process, drilling holes 80 feet deep and heating the rock in situ. Vapors were funneled to the surface through a perforated production well, condensed into crude oil, and refined into kerosene, diesel, and gasoline. The 500,000 barrels of crude oil Ljungstrom produced “were better than what was coming out of the oven, because he was cooking the rock more slowly, at lower temperatures,” Vinegar explains. Ljungstrom died in 1964, but he left behind voluminous records. Shell conducted simulation tests of his method in its labs. The results were intriguing. Vinegar improved upon the Swedish results while working on Shell’s fledgling projects in the Piceance Basin of northwestern Colorado, starting around 1980. Here, oil-shale deposits up to a thousand feet below the surface are thought to hold 800 billion barrels of recoverable oil–among the richest deposits in the world. Vinegar developed horizontal heaters that could generate high temperatures for months without burning out. With these, geologists could target the richest part of the oil-shale bed while leaving a minimal footprint on the surface. Heated correctly, the surrounding rock would take roughly three years for total molecular conversion of the kerogen into light crude. “After a few years of heating, the product was mostly clear,” says Vinegar, who worked on seven Colorado projects for Shell over more than a quarter century. The oil-shale industry in Colorado never really got off the ground. The high costs of heating and drilling wells made commercial oil-shale production unprofitable, especially when the price of oil fell. There were also environmental concerns, some involving the fact that the main aquifer in northwest Colorado runs through the oil-shale bed. While commercial production stalled around 1990, Shell has continued its R&D efforts there. Shell is now also taking its technology overseas. In August 2009, Jordan’s King Abdullah granted the company oil-shale exploration rights to an 8,600-square-mile territory. In October 2008, Vinegar retired from Shell. He and his wife emigrated to Israel, where he planned to take a teaching post. That really was the plan, he insists. But then Bartov, who had met Vinegar years before in Colorado, persuaded IDT chief Howard Jonas to ask the Shell veteran to bring his alchemy to IEI. Bartov was convinced that if anyone could get oil from the ancient shale in the Valley of Elah, it was Vinegar. While scientists from the Geological Survey of Israel had identified the Elah lode in 1980, not a single oil company had bothered to pursue it. Instead, they focused their energies on modest deposits of oil shale that lay just beneath the surface in the Negev Desert. “People said, ‘Three hundred meters down? Nobody is going to go to that level,’ ” remembers Vinegar. Above the Valley of Elah, Bartov walks me over to an outcropping that he says mimics the geological strata deep below ground. He points out a layer of chalk above a layer of porous limestone. The chalk is light and breaks apart easily, but it has small pores and low permeability, which keeps liquids from seeping through it. Beneath the earth, Bartov tells me, the chalk layer is 600 feet thick, forming an impermeable barrier between the oil shale above and the limestone below. So even though one of Israel’s main aquifers runs through the limestone, this one is “completely isolated from the oil shale,” he insists. “There is no danger,” claims Bartov, that the groundwater will be contaminated by hydrocarbons expelled during the heating process. Bartov and Vinegar promise that the heating process will be clean, energy efficient, and economical. Early on, IEI will heat the oil shale with electricity provided by natural gas, which is plentiful and cheap, and emits relatively low amounts of carbon dioxide. 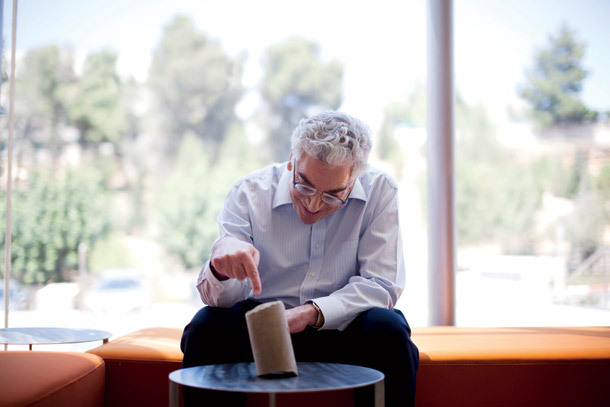 Eventually, says Bartov, electricity could be replaced by molten salt, a more energy-efficient technology widely used, above ground, in chemical and solar plants. By 2021, IEI could provide enough diesel and jet fuel from the Shfela Basin to cover Israel’s military and civil aviation needs. After that, IEI would ratchet up crude-oil production to 270,000 barrels a day–the total amount of oil consumed in Israel–“if the country wants it,” Vinegar says. Engineers and geologists searched everywhere for the next big strike. “The government supported oil exploration with good sums of money,” says geologist Eliezer Kashai, a Hungarian who emigrated to Israel after World War II. But the Heletz-Kokhav field has produced just 17.5 million barrels of oil–less than Saudi Arabia produces in three days. Momentum petered out. For decades, the Israel National Oil Co. seemed a joke. Five hundred wells were drilled across Israel between 1960 and 1985, almost every one dry. In 1986, the national oil arm suspended drilling. Just a few true believers remained, their faith backed by the Bible, not geology. In 1981, Ohio-born evangelical minister Jim Spillman published a book, The Great Treasure Hunt, which argued that certain Old Testament verses, including references to “a fountain” and “a well,” and to Joseph receiving from God “blessings of heaven above [and] blessings of the deep that lieth under,” pointed to vast oil wealth hidden in the Holy Land. Michigan tool company executive John Brown, a reformed alcoholic and born-again Christian, was so taken with Spillman’s vision that he founded Zion Oil and Gas and obtained rights to drill on a large plot in northern Israel. “Brown knew nothing about oil and gas,” says Richard Rinberg, Zion’s CEO, who works from an office in Caesarea. “At the beginning, [the search] was 100% faith-based.” But now geologists on Zion’s payroll–including Kashai–believe Brown might have been onto something, citing a Triassic reef found deep below the surface, a strong indication of fossil fuels. Since 2007, Zion has raised nearly $90 million in funding. It has drilled three wells so far, finding only traces of fossil fuels. After all this, the discoveries of Leviathan and Tamar seem like answered prayers. Yet, as the saying goes, be careful what you wish for. Israeli environmentalists warn that the natural-gas fields, which are being drilled under less stringent regulations than American sites, are a Gulf of Mexico–like nightmare in the making. “Aside from the Strait of Gibraltar and the Suez Canal, the Mediterranean Sea is a lake,” says Dov Khenin, a Knesset member who is introducing legislation for stricter regulations on drilling. “If an environmental disaster happens there, we face a grave problem.” Then there’s the government of Lebanon, which claims Leviathan and Tamar extend into its own maritime borders; in the war of words between the two countries, the threat of actual war has been raised. The biggest barrier to Israel’s energy bonanza, however, is not geopolitics or technology; the true enemy of what has traditionally been seen as progress–a discovery of fossil fuels that might turbocharge the economy–is the country’s own citizenry. Israel is something of a small village in global terms–you could fit 13 Israels into Colorado, despite Israel having 50% more inhabitants. But it is a noisy village, and many Israelis have raised rancorous opposition to IEI. They view IEI’s project as a threat to their very lifestyles; they question everything that Vinegar, Shafir, and Bartov tout as benefits. In doing so, they raise interesting questions about drilling in the 21st century. IEI’s site is near a geological fault. If a major quake hits while the oil shale is being heated, says environmentalist Arye Wanger, “it could be like spilling a few tankers of crude” into Israel’s main aquifer. Tishler and other environmentalists, including Arye Wanger of the Israel Union for Environmental Defense, have a litany of fears. Tishler disputes the idea that a chalk layer will protect the aquifer. She believes pollutants will be expelled into the atmosphere during the refining process, despite the insistence of IEI officials that sulfur and other contaminants will be captured and managed. And she worries that oxygen could seep into fissures below the surface, ignite under extreme heat, and explode. Not a single claim of the pro-development faction is taken for granted in this debate. Government boosters such as Minister of National Infrastructures Uzi Landau contend that the new fossil-fuel finds will give Israel a geopolitical heft well beyond its minuscule size. And Einat Wilf, a Knesset member from Ehud Barak’s newly formed Independence Party, says, “It could be a real game changer” in the United Nations, where the country can only count on the backing of one global power, the U.S.
Brenda Shaffer, an energy expert at the University of Haifa, finds such promises overblown. The experience of other countries with comparable amounts of natural gas gives her pause. “Azerbaijan produces a lot more gas, but their conflict with Armenia hasn’t been resolved,” Shaffer says. “Gas flows from Egypt won’t preserve peace with Israel. Libya brings more gas to market in Western Europe than Israel ever will, but that doesn’t mean that NATO won’t bomb it.” Only the powerhouses in natural gas, Russia and Saudi Arabia, have translated economic might into political muscle. In April, IEI celebrated a partial victory: The Israeli Supreme Court tabled a petition by a coalition of environmental groups to stop the pilot wells, agreeing only to hear the case before a full body of three judges in April 2012. In the interim, the court said, the pilot may move ahead as planned. Still, IEI faces numerous bureaucratic delays. 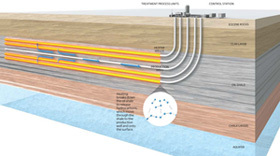 The company hopes to drill three 1,000-foot-deep wells 3 meters apart from one another, and heat the rock for 270 days as part of a demonstration project that would produce 2,000 barrels of crude oil a day. But even though IEI has obtained the license necessary for drilling, it cannot move ahead until it gets a land-use permit from Israel’s minister of the Interior. And the final go-ahead won’t come just from that ministry, but in concert with a district planning and building committee that includes representatives of local communities and officials from the Ministry of Environmental Protection.